Chenoweth explains that encounters with homeless not just a job but "part of my faith"
(CNN) -- By now, millions of Americans have heard from Ted Williams. 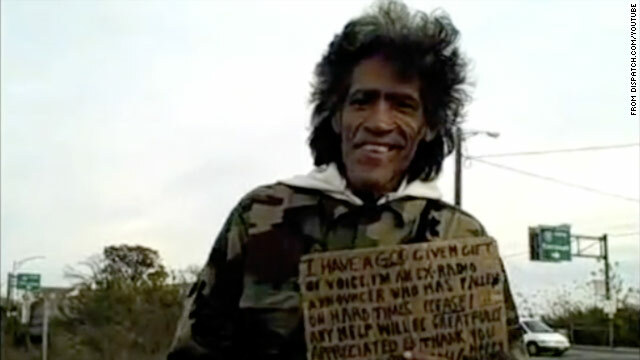 He's "the homeless man with the golden voice," a panhandler whose stunning vocal skills were recorded for an impromptu video that's netted at least 4 million views on YouTube. But what about the good Samaritan with the video camera? What made him stop for Williams on a dreary, overcast day when scores of people ignored the African-American homeless man during the peak of the Christmas season? It turns out that Doral Chenoweth III, the man who filmed Williams, has a story of his own. Five weeks ago, Chenoweth was driving to Lowe's with his wife, Robin, when he spotted a thin man with wild, unruly hair at an intersection. The man held a cardboard sign that read, "I have a God-given gift of voice. ..."
Chenoweth stopped and talked briefly with Williams, but he couldn't stay long because he had company at home. He returned, however, a week later. "Hey, I'm going to make you work for your dollar," Chenoweth said as he rolled down his window and took out his flip camera. "Let me hear you say something." What comes out of Williams' mouth is startling. It's a rich, baritone that doesn't match his craggy exterior at all. His enunciation is crisp, his tone smooth as suede. Williams isn't holding that cardboard sign anymore. After Chenoweth posted the video, it went viral. Williams did interviews on national television and radio. He's received several jobs offers, including one that comes with a home. A reunion with his 92-year-old mother is being arranged. But the other character in this contemporary parable had played this part before. "The first time we dated, he stopped and gave a blanket from the back of his car to a man who was homeless," said Robin Chenoweth. "I thought to myself, if he has this kind of compassion for a man on the street, he's going to make a great husband and father." Chenoweth is paid to notice people. He's a multimedia producer for The Columbus Dispatch newspaper in Ohio. He said he stopped because he thought Williams might make a good video. Still, he wasn't so sure after the filming. He said he sat on the video for five weeks until he finally decided to use it because it was a slow news week. Then he watched the video take off. "I never anticipated this," he said. "A week ago, he was living in a tent behind a station in the middle of December, and now he's being flown to New York and his video is everywhere." But the reason Chenoweth stopped goes deeper than his job. It's "standard operating procedure" for him, he said, to stop and talk to people who are homeless, whether he's carrying a camera or not. "It's part of my faith," he said after some prodding about his motivations. "You may not be able to help someone with money, but you can at least say hello, how you doing, and look at them." Doral Chenoweth III, his wife, Robin, and their children Cassie and Kurtis went on a personal mission trip to Tanzania. About 14 years ago, Chenoweth said he was assigned to photograph a homeless ministry at New Life United Methodist Church in downtown Columbus. He was so impressed by the ability of the 50-member congregation to help the homeless that he and his wife joined. The church's pastor said that Chenoweth routinely invites people who are homeless to the church for meals and medical attention. He's also photographed people on the street and displayed their photographs to emphasize their humanity, said the Rev. Jennifer Kimball Casto, New Life's pastor. When asked if she was surprised by Chenoweth's action, Casto said: "Absolutely not. Doral has a special heart for people who are homeless and in need." Chenoweth's concern for people goes beyond Columbus, and even the United States. His wife said they are regular Habitat for Humanity volunteers. They've also taken seven trips to Africa to serve impoverished communities. Chenoweth has documented many of the trips on his website. "He's taken me all over the world," Robin Chenoweth said. "He's a fabulous husband. It's the best decision of my life to be with him." Chenoweth sounds thrilled to see where the new-found fame will take Williams. He had a reunion with Williams after their video went viral. A local radio station interviewed Williams, and Chenoweth was there for the interview. "We had a big hug and shook hands," Chenoweth said. "He almost cried when he saw me." Chenoweth was watching a local radio station interview Williams when he saw something that touched him. "He still has my business card," Chenoweth said. "He's been carrying it the whole five weeks since I gave it to him. He was carrying it right in his fingertips." The Rev. Tom Long, a professor of preaching at the Candler School of Theology at Emory University in Atlanta, watched the video of Chenoweth's encounter and saw a visual parable unfold. It reminded him of Jesus' parable of the good Samaritan. In the parable, a Samaritan stops to help a man wounded by robbers after two Jewish religious leaders -- a Levite and a priest -- pass the man by. The story was shocking because the hero was a villain -- Samaritans were a group of people hated by many 1st century Jews (imagine the parable of the Good Crack Dealer). Chenoweth didn't see Williams as "visual white noise" to tune out, Long said. "He sees possibilities others don't see and acts on them and, wow, here we go," Long said. Long said there's more to the story than the importance of treating people in need with compassion because miracles may happen. "His (Chenoweth) experiences expose what is already true about people, that even a homeless person who doesn't have a golden throat is nonetheless a child of God." Casto, Chenoweth's pastor at New Life, said Chenoweth taught another lesson with his encounter with a panhandler. "We are all broken in some way, but we are also gifted in some way," she said. "Mr. Williams is a perfect example of that."